SNES Final Fantasy V & VI (JPN) in 3:52:15.97 by neo_omegon. Watch as two Final Fantasy games, V and VI (VI is also III in North-American publication), are beaten with one controller's input. Since FFVI takes longer to beat than FFV, the FFV run also beats a few optional bosses which are not fought in the single-game run of FFV. The two games finish at the same time. 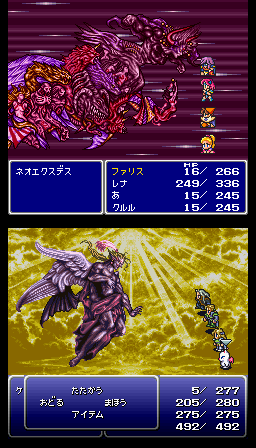 Since FFV is only available in Japanese, FFVI is also played with the Japanese version. The (J) version of FFVI also has an equipment glitch which is not present in the (U) version. Otherwise, this run of FFVI is quite similar to our single-game FFVI movie. For more details, we suggest you read the submission comments. Note: The encodes are stacked horizontally, even though the screenshot is stacked vertically.